Mallet toe - this happens when the distal phalanx is displaced downward giving the appearance of a mallet. As with a claw toe, a thickening of skin or corn may grow at the tip of the toe where it is touching the ground. Hammertoe - is when the proximal phalanx causes the middle phalanx to bend downward and the distal phalanx to lay flat on the ground. A thickening of skin known as a corn may occur on top of the toe at the contracture. 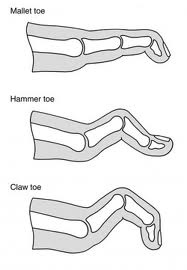 Claw toe – is what happens when the middle bone is pulled significantly downward causing the proximal to buckle upward with the middle and distal phalanx bending downward. A corn may develop at both tip of the toe (mallet toe) and the top of the contracture (hammertoe). If left untreated, these ailments can lead to other problems such as calluses (corns), infection and ulcerations. These conditions can either be treated conservatively with padding and debridement or permanently with a surgical procedure.